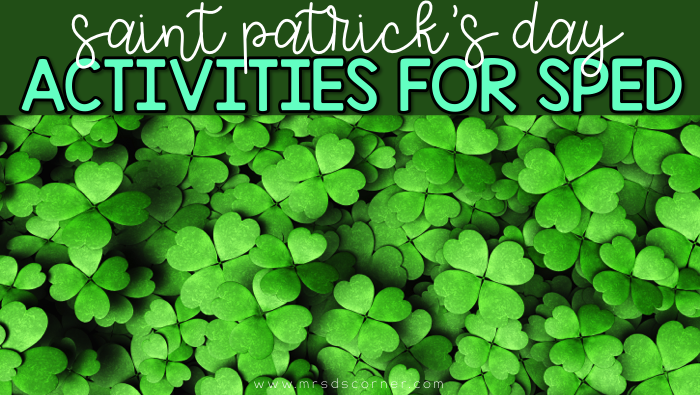 I love prepping lessons for Saint Patrick’s Day… for some reason, it is one of my favorite holidays to plan for in the classroom. There are so many great children’s books and so many crafts that you can incorporate into the classroom, making for a really fun week! My St. Patty’s Day lesson plans are very hands on and full of lots and lots of learning in all academic areas. 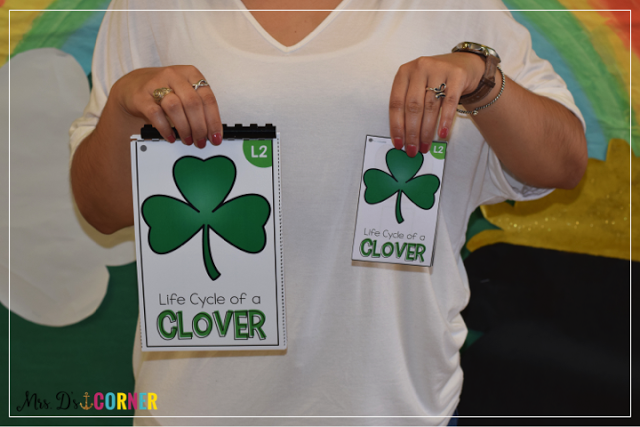 We talk a lot about the life cycle of a clover / shamrock. It’s a great topic to integrate science and social studies into our ELA lessons. These resources help us with our sequencing skills, comprehension, and writing… just to name the first few. I absolutely love these adapted books because I can print a “normal” sized version to have in centers and to share in reading groups, and the students get to follow along with a mini version. 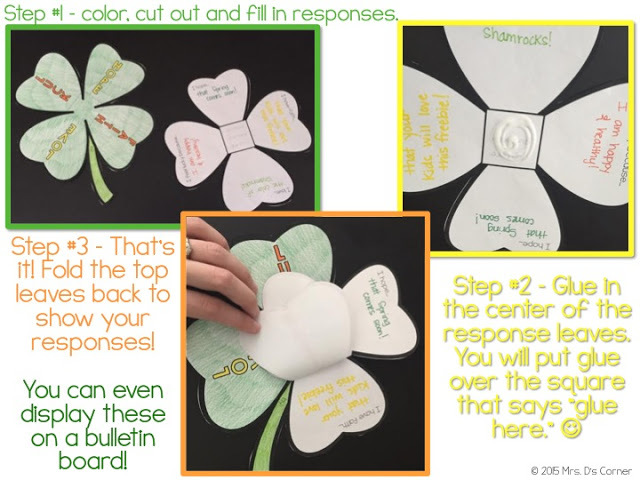 To continue on with the life cycle, we do this activity… and this flip flap book is probably one of my absolute most favorite activities of the week. It is highly differentiated for my students, but it all contains the exact information. So instead of having 3 different reading groups, I have 1. ONE… and it is the most refreshing feeling when I can have all of my students working on the same thing at the same time. 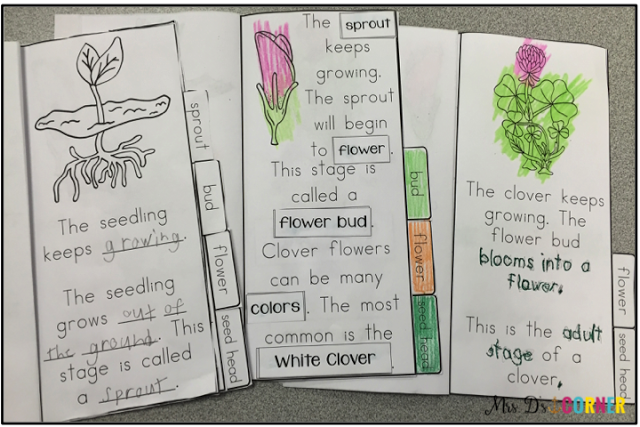 I pre-cut the flip books and have them ready to go for the lesson, saving a lot of time. When it comes to math time, we bring out the good stuff… meaning the mats and manipulatives. If you don’t check the Dollar Tree for cheap lesson plan supplies and storage, here is your reason why you need to start… like yesterday. I spice up our addition and subtraction practice with this shamrock-shaped bowl and some plastic leprechaun coins. 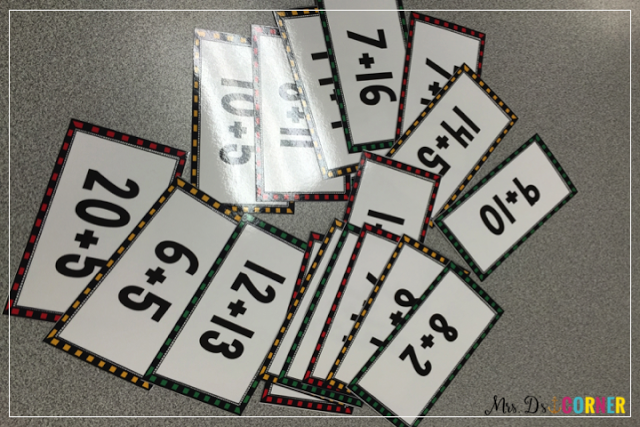 We used these addition cards during our math time. I flip the cards upside-down and have students choose 5-6 cards. 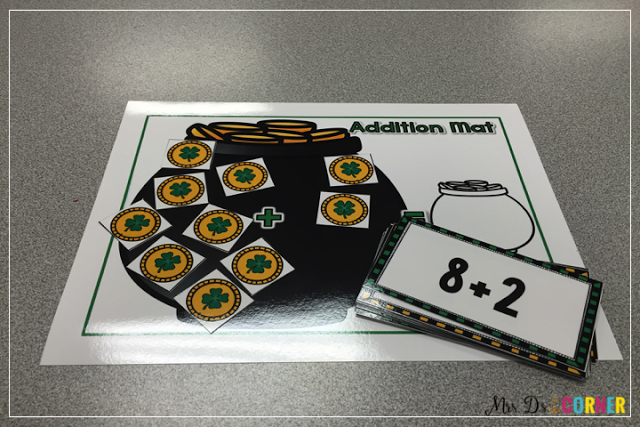 Then they will use the leprechaun coins and addition mat to solve. You could easily use a dry erase marker to write problems on the table or a whiteboard… or use problems out of a workbook. 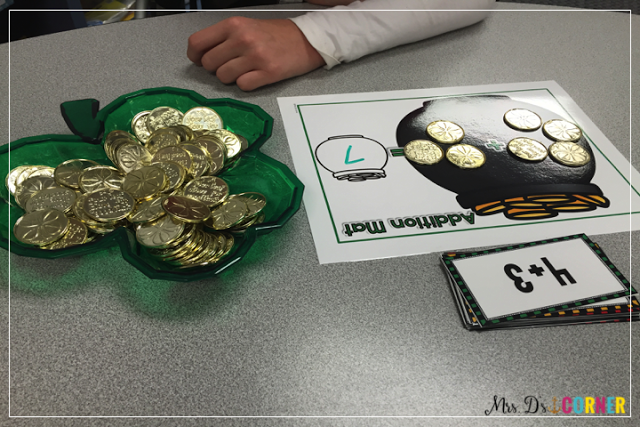 You can use any type of manipulative to count, but using leprechaun coins makes it so much more fun for everyone! 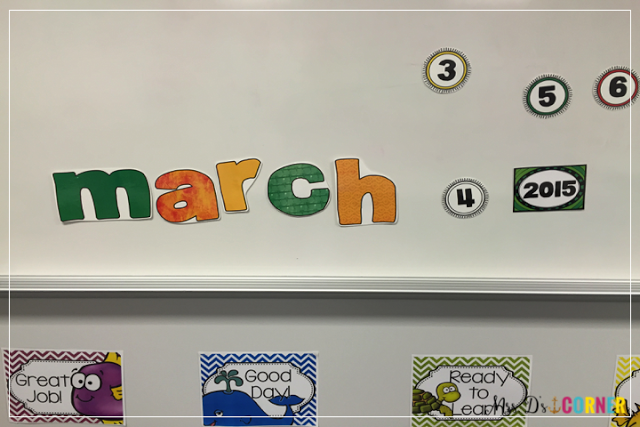 Since February, March, and April are super high stress months for both the teacher and the students, I always find myself utilizing different ways to practice the very basic of skills… like calendar. We literally do the same exact calendar activities every day. It’s very rote, which is great for my students who need that daily exposure and repetition to learn the basic skills. But I also have one student who gets bored easily, which is a great opportunity for me to say, “Hey, it’s time to spice it up a little bit and try something new!” Keeps me on my toes, which is part of what being a teacher is all about. 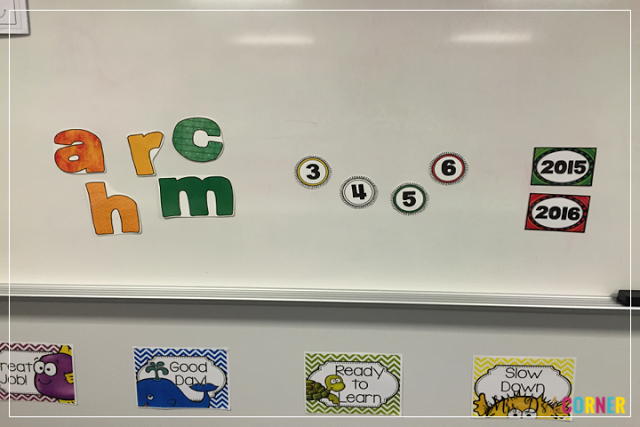 So I print large letters off (I just make them in PowerPoint) and use number circles, add magnetic tape to the back and put them on the front whiteboard. It’s an independent center, and one that the student can self check (using the regular calendar). I can easily look up while working with another student to tell the student at the front board to “check your spelling” or “try again”. 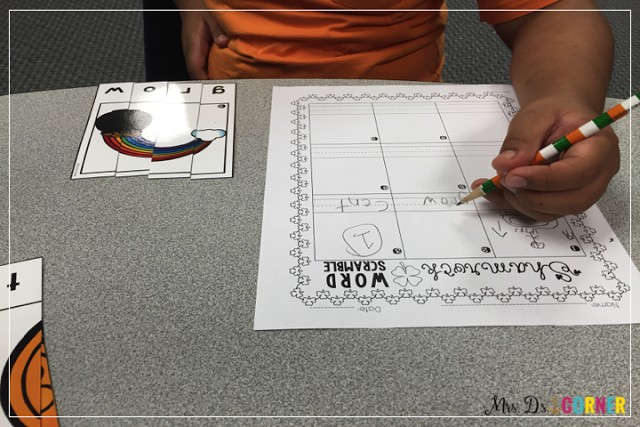 We’re always working on sight words too… and spelling… and writing… and puzzles for other basic skills. So word scrambles work very well in my classroom. You can hide pieces around the classroom to make it more of a “work the room” kind of thing, or just hand the student the 4 puzzle pieces. I have them put the picture together first, then we work on sounding out the words. Where the spelling and writing comes in to play is on their documentation paper. They have to write each word, spelling it correctly (which you think would be easy since they are copying it from the puzzle, but for some students this is a difficult task), and then draw the picture above the word. 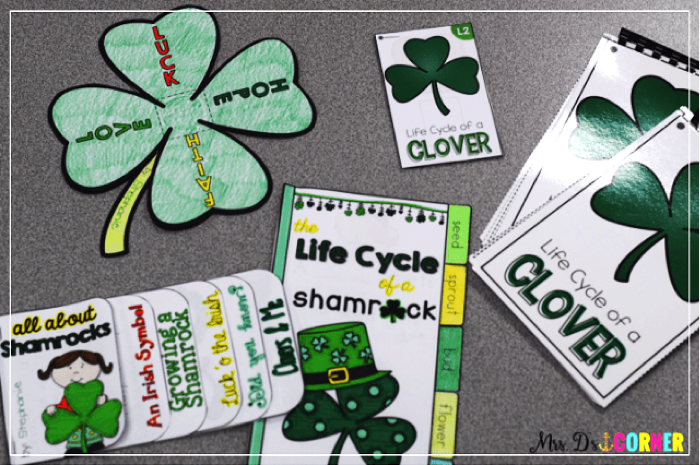 To finish off our academics for our St. Patty’s Day fun, we did these cute little shamrock writing craftivity. Under the flaps we write what they love, how they feel lucky, what they hope for, and what they have faith in… which is the best part because they’re so honest. My absolute most favorite thing about the holidays is our photo booths. My paraprofessional helps build the bulletin boards in the hallways and we either buy or make the photo booth props. It serves as a great reward for my students because they all love having their picture taken. So we let them use whichever props they want, we take their picture, and then print them out to share with their families. 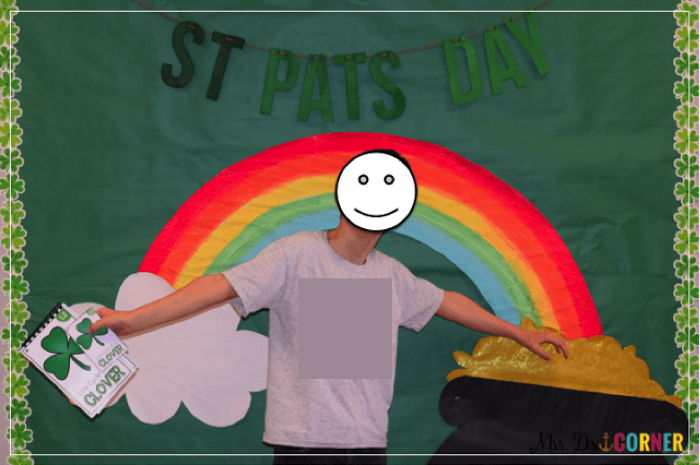 My friend above was super excited about this photo booth because he wanted to steal all of the leprechaun’s gold. LOL! Me too kid, me too. What is your favorite activity for use for St. Patty’s Day?